Supreme Court Justice Ruth Bader Ginsburg’s health is on the decline. On Monday, she missed oral arguments for the first time in 25 years. However, President Donald Trump is acting fast, and “gingerly preparations” are underway. On Monday, Supreme Court Justice Ruth Bader Ginsburg missed oral arguments for the first time in her 25 years on the bench, raising suspicions that perhaps her health has deteriorated to a point where retirement is imminent for the judge. Supreme Court spokeswoman Kathy Arberg said that Ginsburg missed Monday’s arguments because she was still recovering from surgery she had in December in order to remove malignant nodules on the lower lobe of her left lung. At that time, liberals came out of the woodwork to offer Ginsburg their organs in hopes of keeping her alive as long as possible to stop President Donald Trump from appointing another conservative judge to the Supreme Court. 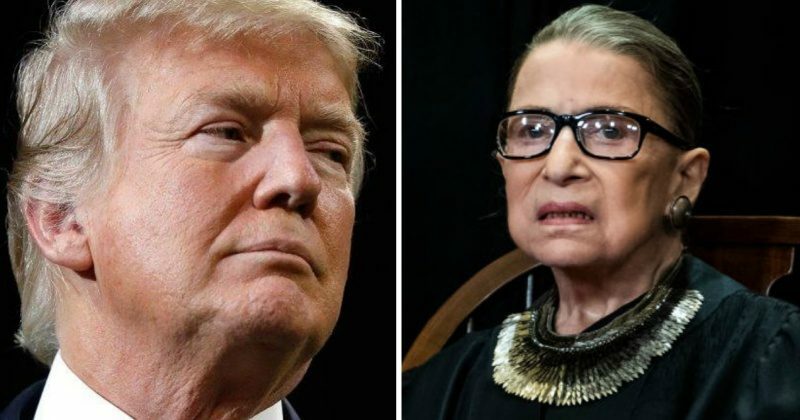 After the latest medical scare, many are asking whether Ginsburg will continue to serve on the Supreme Court or finally retire, allowing President Donald Trump the opportunity to appoint a third justice to the highest court in the land. And with Ginsburg’s health on the decline, Trump is quietly preparing to do just that, according to sources at the White House. “Gingerly preparations are underway, not just for Ginsburg but for any SCOTUS retirement,” said a source directly involved in the Supreme Court nominations of Justices Neil Gorsuch and Brett Kavanaugh. The Supreme Court became a central issue of the 2016 presidential election. Whoever was elected would have the opportunity to appoint at least two — possibly three — new justices to the bench. Conservatives argued that this was perhaps the single most important reason to vote for Trump. If Hillary were given the opportunity, she could turn the highest court in the land decidedly left for the next generation. Thankfully, that did not happen. President Trump is systematically appointing judges who will uphold the values enshrined in our Constitution, not just to the Supreme Court, but to courts all over the country. Hopefully, he will get to appoint another judge like Neil Gorsuch and Brett Kavanaugh to the Supreme Court.